On Sunday 19 August we will have the honour to pour some of the best Scottish beer we've ever tasted. This limited edition and much in demand range by Fyne Ales will be paired with some cracking food by our team. Basing a menu on the 10 wonderful beers that make up the Origins series we'll serve a flight of the 10 beers, alongside food to match each one. Andrea Ladas, the head brewer of the Origins project, will be around to pour the beers and talk with you about the brewing and inspirations. 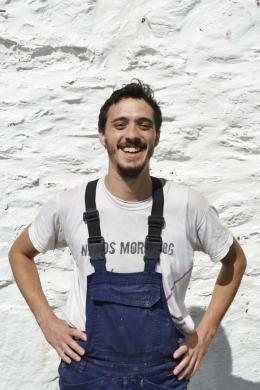 Andrea Ladas is an Italian-Greek “gypsy” brewer, focused on crafting creative brews and inspired by continuous travels. With the Origins Brewing project at Fyne Ales he explores new flavours and adventurous techniques, he brews unconventional beers well rooted in the West of Scotland. His belief is that one day there will be no borders between beers and wines, just fermentations, and people will drink in peace. The Origins beers are made in tiny batches and released in small collections - in essence, they are rare! When a beer is sold out, it won't be available again. So here's your opportunity to taste all of them in one go! The Origins project is not only exciting for the Fyne Ales brewing team, but also for EFS, as one of these special brews has been crafted in collaboration with Sashana and Ben from EFS. These beers are special and are a beautiful expression of savoir-faire, landscape, seasonality, experimentation, collaboration, and the magic of fermentation. Fyne Ales is a farmhouse brewery that has been making amazing beers since 2001. The Origins Brewing project has been a long time coming - it's the culmination of four years of learning, experimenting and developing a vision for what the project should be. Between Summer 2013 and Autumn 2017, Fyne Ales has barrel-finished a beer for the first time, produced its first mixed fermentation beer, began brewing lactobacillus beers on a commercial scale, brewed our first spontaneously fermented beer(s) and created the Farmhouse Project, a series of beers that were effectively a pilot for Origins Brewing. The Origins project is unique and avant-guarde in Scotland. It's an exciting project which is pushing brewing boundaries, giving the possibility to learn more and discover new avenues. Not only that, but we are especially honoured to have collaborated with Fyne Ales last Spring on the 'Forest Flore' edition, which will definitely be available on that Sunday. If you fancy trying something new, and especially if you love spontaneously fermented and barreled conditioned beer, this event is for you! The price for your Sunday brunch and beer pairing is £40. Click the button below to book.